Happy Thursday! I'm so glad you stopped by for another wonderful color challenge from The Play Date Cafe. This week, Mona picked some lovely pastel colors: Pale Yellow, Light Green and Pink. Not being a pastel gal myself, Mona's colors pushed me out of my comfort zone - thanks Mona! I didn't have any pattern paper to match this weeks colors, so I opted to create my own background with a little bit of embossing, some Watercolor card stock, a spritz bottle, and reinkers. The lovely Flourish is a stencil from Stampin' Up! I swiped my Embossing Buddy over a piece of Watercolor paper so I wouldn't end end up with stray flecks, put my stencil in place, and pounced over the opening with a Versamark Pad. Remove the stencil, then White Heat Emboss. Once cool, spritz paper with water, then drop on some reinkers, spritz again to get the colors to spread. While still wet, you can either smoosh another piece of Watercolor paper over to soak up the extra (you'll also have that piece then to stamp on), or hit it with your heat gun to speed up the drying process. The sentiment from Stampers Anonymous is Brown embossed on the remaining colored panel. I hit both Watercolor panels with the Distrezz-it All. 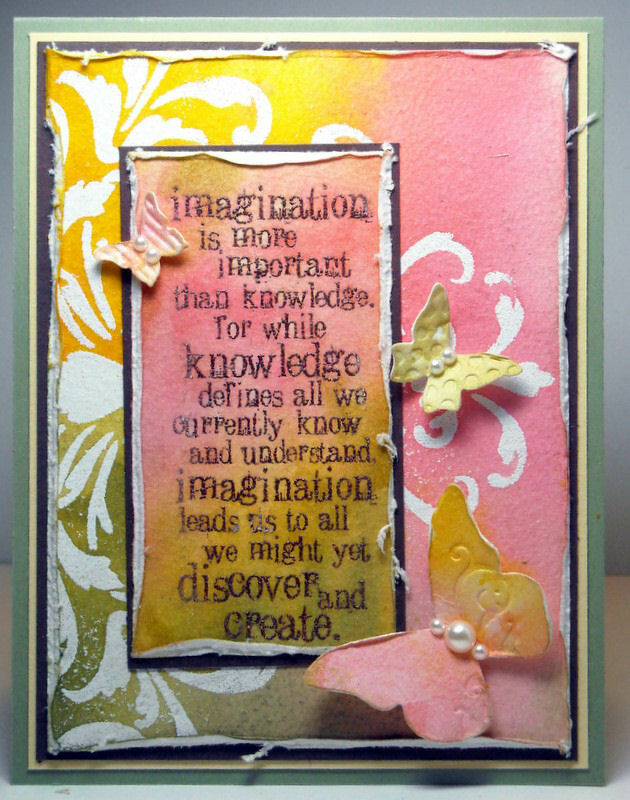 The fluttering butterflies are from Stampin' Up!' Beautiful Butterflies Embosslit. Here's this weeks Color Story Photo - Pale Yellow, Light Green and Pink. We'd love for you to play along with this weeks challenge at The Play Date Cafe, you can find all the details here on how to enter. Very artsy GF,luv the stencil work, gotta try that! It really adds to the project! love the card and the colors you used. thanks for sharing how you did it too. This is gorgeous, Lisa! This makes such a pretty background. Oh my gosh Lisa! This card is beautiful! 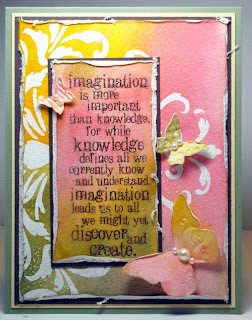 Love the soft look & great use of stencils! Wow! What a wonderful creation, Lisa! For not being a pastel gal, you worked magic with this!! Lovely card Lisa! I must learn how to do my own backgrounds when I don't have the colours I need. I usually just go into a panic lol. Love what you've done this week with the colours, you've made them look fab! Beautifully done and very elegant layout! Lisa, You may have been pushed out of your comfort zone, but certainly no one would ever know! Love how you put those colors together to form a beautiful card!